↑ "Boko Haram at a glance". Amnesty International. สืบค้นเมื่อ 25 January 2015. ↑ 2.0 2.1 "Boko Haram HQ Gwoza in Nigeria 'retaken'". ↑ 3.0 3.1 3.2 3.3 Bureau of Counterterrorism. "Country Reports on Terrorism 2013". U.S. Department of State. สืบค้นเมื่อ 7 August 2014. ↑ 5.0 5.1 5.2 "Jonathan tasks Defence, Foreign Ministers of Nigeria, Chad, Cameroon, Niger, Benin on Boko Haram's defeat". sunnewsonline.com. ↑ 6.0 6.1 6.2 Martin Williams. "African leaders pledge 'total war' on Boko Haram after Nigeria kidnap". The Guardian. ↑ "Chadian Forces Deploy Against Boko Haram". VOA. 16 January 2015. สืบค้นเมื่อ 16 January 2015. 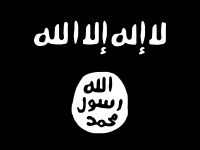 ↑ "IS welcomes Boko Haram allegiance: tape". AFP. 12 March 2015. สืบค้นเมื่อ 12 March 2015. ↑ "Nigeria's Boko Haram pledges allegiance to Islamic State". BBC news. BBC. 7 March 2015. สืบค้นเมื่อ 7 March 2015. ↑ "Boko Haram Changes Name To 'West African Province' Of The Islamic State". Daily Times of Nigeria. 23 April 2015. สืบค้นเมื่อ 21 July 2015. ↑ "ISIS Global Intelligence Summary March 1 – May 7, 2015" (PDF). Institute for the Study of War. 10 May 2015. สืบค้นเมื่อ 12 May 2015. ↑ "Behind Boko Haram's Split: A Leader Too Radical for Islamic State". Wall Street Journal. 15 September 2016. สืบค้นเมื่อ 16 September 2016. ↑ 19 July 2014 (2014-07-19). "Boko Haram insurgents kill 100 people as they take control of Nigerian town". Guardian. สืบค้นเมื่อ 2014-07-20. ↑ Africa Program at the Council on Foreign Relations (2014). "Nigeria Security Tracker". www.cfr.org. Council of Foreign Relations. สืบค้นเมื่อ July 21, 2014. ↑ Glenn Kessler (May 19, 2014). "Boko Haram: Inside the State Department debate over the 'terrorist' label". Washington Post. สืบค้นเมื่อ 3 August 2014. ↑ 3 January 2015 (2015-01-03). "Boko Haram unrest: Gunmen kidnap Nigeria villagers". BBC. สืบค้นเมื่อ 2015-01-05. ↑ 15 August 2014 (2014-07-15). "Boko Haram Kidnap Dozens Of Boys In Northeast Nigeria: Witnesses". Huffington Post. สืบค้นเมื่อ 2015-01-05. ↑ "Islamists force 650 000 Nigerians from homes". News 24. 2014-08-05. สืบค้นเมื่อ 6 August 2014. ↑ "Boko Haram Overruns Villages and Army Base in Northeast Nigeria". Wall Street Journal. 5 January 2015. สืบค้นเมื่อ 5 January 2015. หน้านี้แก้ไขล่าสุดเมื่อวันที่ 29 มิถุนายน 2560 เวลา 01:59 น.